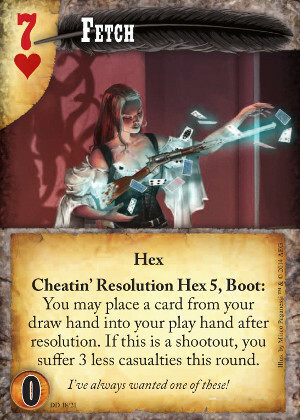 Can someone please explain to me specifically who can use cheatin' resolution cards and against whom? The reason I ask is because the base rulebook (unless there have been errata/changes made) states that you cannot use a cheatin' resolution ability on yourself, neither can any one player have more than one card/ability used against them each hand round. 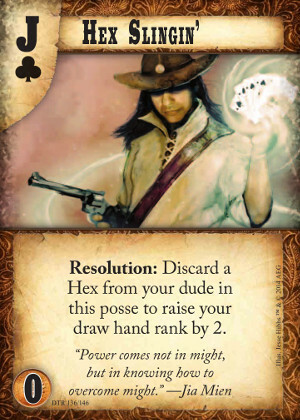 However, the hex [Fetch] and the action [Magical Distraction] are directed at yourself, so based upon those cards the rule of not using an ability on yourself must be incorrect. If you can use abilities on yourself, what counts as being "against you" as far as the one card rule goes? The example of Fetch, is that an action "against you" (even though it's clearly positive)? Or has the rule been amended to state that that rule only applies to others using abilities against that player? Magical Distraction can very definitely benefit me, but it can also be against be if I get a bad pull. Finally, what is the order of plays, and can a cheatin' player play cheatin' cards even if his/her opponent didn't cheat? I assume we start from the Winner and go around as normal, but what if the Winner is the only one who cheated? 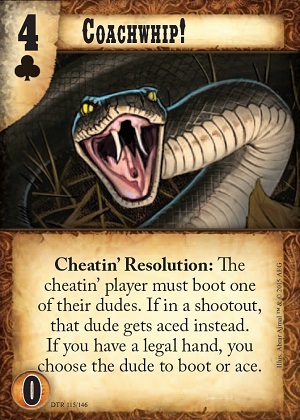 Can those cards I mentioned be used by me if I was the one who cheated (it seems to make sense, if the outfit is an underhanded group, and there are some dudes who benefit you for cheating after all)? Sorry, I thought using the  around a card name would link it to the card stats. I remember a Magic site where that was how you did it. I guess I'd better suss that out. Let's assume there are two players - Player A and Player B. 1) Let's assume Player B cheats - in this instance only Player A can play a cheatin' resolution as the rules state the cheating player (the person who reveals a cheating hand) cannot trigger their own cheatin' resolution based on their own cheating. There are currently two instance when cheatin' resolutions are relevant. Action 3 - Player A plays Coachwhip! 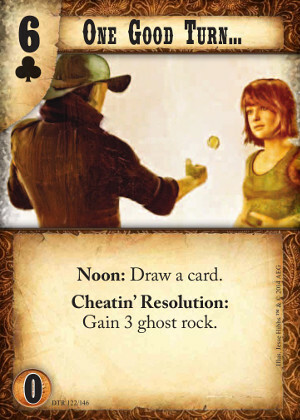 2) Cheatin' Resolutions (but not normal Resolutions) can also be played during lowball. The person who gets the first opportunity is the previous day (aka turn) winner of lowball. 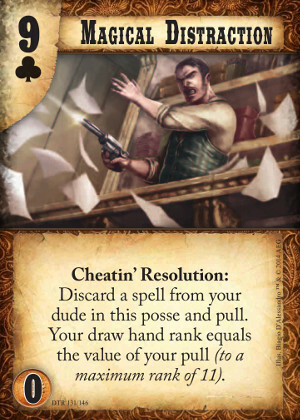 In the event it's the first day of the tgame, you may pull the top card of your deck, and the person who pulls a lower value gets the first opportunity to use a cheatin' resolution against the instance of cheating. Apologies if that was confusing! Sorry for not replying sooner. I'm just pondering what you said and making sure I have it worked out in my own head and how I want to word any further questions. So, when someone cheats, the whole thing of only one play being able to be used against the player simply means every player except the cheater gets one cheatin' resolution opportunity? So, if two people cheated (say it was a four player game, which most of ours are), then two players could use 2 resolutions each, and the cheaters could use one each? Do you have to specify which player is being resolved against? So, in the case of having 4 players, A and B cheat. Would you say, "We're now resolving cheating against A". B, C and D play an effect. "We're now resolving against B." A, C and D play an effect? Or doesn't it matter? Also, I noticed your example mixed cheatin' resolution plays with resolution plays. Are they both lumped together? I thought it was kinda like Magic - if you didn't play that Cheatin' effect (or Instant in Magic) the moment after the cheat happened, and if you waited until other cards had been played, then it's too late. Or isn't this the case - as long as all the resolution/cheatin' resolution abilities are used in that phase? Almost. Each player can only have one Cheatin' Resolution used against them. It doesn't matter what order they resolve in, or who played them (except that you can't play a Cheatin' Resolution on yourself). So if Players A and B cheat, then Player C plays a CR on Player A, Player D can't then also play a CR on Player A. However any of Players A C or D could play one against Player B (includng Player C playing a second one CR, but this time against Player B). So I think you also have a misunderstanding of how Instants work in Magic (unless you are thinking specifically of counterspells or damage prevention, both of which would be Reacts and not Resolutions in Doomtown). 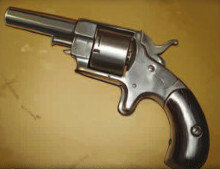 Doomtown and Magic both have "play or pass" turn structure, in that each player is given an opportunity to make a play or pass during each phase of the turn. If all players pass, the turn advances to the next phase. As long as any player keeps making plays, the turn stays in the current phase. 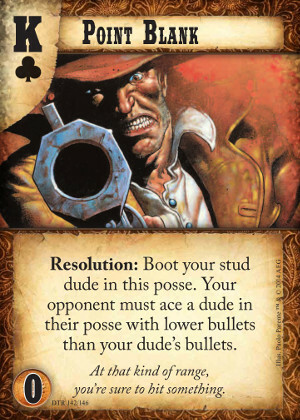 Resolution plays are made during the "Reveal and Resolve" step of a shootout, and Cheatin' Resolutions are just Resolution plays that can only be made if a player has a cheatin' hand. Each player has an opportunity to make a Resolution play or pass until all players have passed, and that can be a regular Resolution or a Cheatin' Resolution. You can play them in any order, as long as only one Cheatin' Resolution is played per cheatin' player. Player C plays Coachwhip! on Player B. No more Cheatin' Resolutions can be played against Player B. Player C plays Coachwhip! on Player A. No more Cheatin' Resolutions can be played against Player A. Player C passes. The Reveal and Resolve step ends and the shootout moves on to the next step, Take Yer Lumps.